Nowadys, filling a downloaded PDF form (from the Internet) with a free Adobe Reader could be a headache. Reason being Adobe Reader may not allow users to fill out the form electronically. You may have to first print it out on papers, fill the form out and then fax it. NextPDF Form Filler solves such problems. It enables you to easily fill PDF forms, save them and print out the PDF forms in your computer even with a free version of the Adobe Reader 8. More importantly, NextPDF Form Filler is user friendly and you can fill in the forms and save your forms in various formats whenever and whatever you want, without the need of a printer, a fax machine or papers. Supporting various output formats, e.g. simple PDF form, flatten PDF form, FDF and XFDF files. Ability to open different formats such as PDF form, FDF form and XFDF form*. Supporting English, Chinese Traditional and Chinese Simplified content. 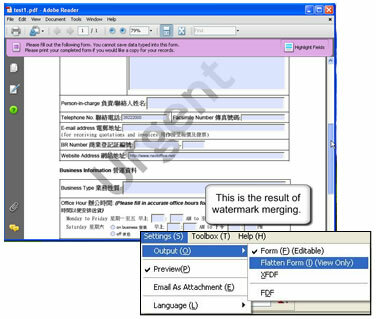 Automatic E-mailing As Attachment when finishing form filling. Adding graphic / text as watermarks or lay as background of PDF documents. Merging two PDF documents into one single PDF document. (By repeating this action, three or more PDF documents can be merged into one). Deleting/Extracting certain pages of / from a PDF document hence creating a new PDF document. Switching user interfaces language among English, Chinese Traditional and Chinese Simplified. NextPDF Form Filler allows users to create different formats when saving the filled-in data as a PDF form, a flatten PDF form, a FDF file or a XFDF file. Choosing to save as PDF form gives users the benefit of editing and modifying the filled-in data easily in the near future. This is the most convenient and prompt way for filling the PDF form, as it is the original method of saving both the Template and the data. Saving as flatten PDF form prevents the filled-in data from being modified by the other persons. As the data will be directly merged with the form and saved by NextPDF Form Filler, the output is no longer a fillable PDF form, and it becomes an image-like PDF form. By doing so, people who get the form cannot modified the filled-in data. Outputing as FDF or XFDF files allows user to handle a mass volume of filled-in PDF forms for data storage or data processing. It has a small file storage size because NextPDF Form Filler only saves the data, making it easy for data management and transmission. The by-condition is a PDF template must be used in order to open the FDF or XFDF files. XFDF is an XML-based version of FDF, it uses the field and value as the storing unit. This means that you get both the benefits of FDF, and also the ability to use your favorite XML tools for data processing. Note: If you want to fill in the mixed characters of Chinese (or double-byte characters) and English in the same fields, it is advised to save as FDF or XFDF files. Best viewed by 1024x768 resolution and with Internet Explorer. All rights reserved. Copyright 2003-2010. Disclaimer.